Patent N° 8,482,535 filed by Apple is based on the idea that a car dashboard, and even handles and dials it can vibrate when touched to the driver who don't have to leave the road ahead to turn their fog lights or air conditioning. The patent also describes how the driver can start with an array of standard board to reposition and then program the buttons using the Apple software for specific operation, but also to customize the apps and the information displayed on the touch screen vehicle. Apple now has a patent for a telematics system with innovative touch screens to customize the buttons of its car. As shown AppleInsider, the patent is nothing but the continuation of another filed in 2011 and similar applications exist since 1992. This shows that in any case the firm at the apple plans to incorporate computers to cars for many years. The patent also interested in views as well as head-cameras that monitor the movements of the driver. Apple unveiled its ambitions car in June 2012, when the firm announced Siri Eyes Free, adjustment to iPhone optimized specifically for drivers who can access many features of the smartphone by voice command. 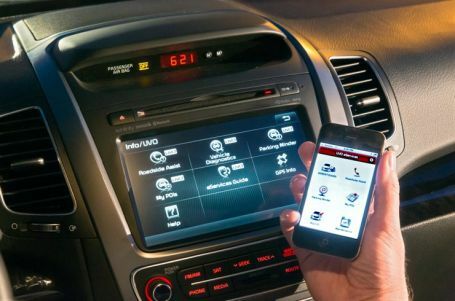 On the occasion of the opening of the World Wide Developers Conference presentation in June, Apple's Eddy Cue announced that the full integration of iOS in dashboards car became reality in 2014, and 12 manufacturers were already concerned (Ferrari, Honda, Mercedes-Benz, Nissan, Chevrolet, Infinity, Kia, Hyundai, Volvo, Opel, Jaguar Land Rover and Acura).